I have been on a big dehydrator kick lately! My dehydrator usually has either pineapple, apples, or almonds in it at all times! Raw nuts contain enzyme inhibitors that make them hard to digest. Soaking almonds overnight in salt water helps to release those enzyme inhibitors and therefore makes them healthier because the nutrients are more easily absorbed. 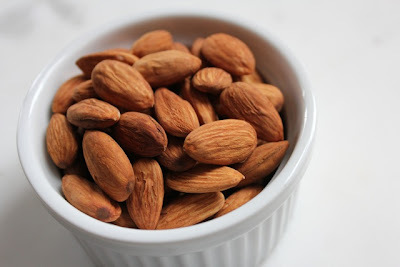 Honestly though, even if soaked and dehydrated nuts weren't healthier, I would still be a convert because the flavor and texture of soaked and dehydrated almonds is far superior to raw or roasted almonds! - Cover about 4 cups of raw* almonds and 1 tablespoon of sea salt with warm filtered water, cover and soak overnight. - Place in dehydrator and dehydrate until crispy. This usually takes my dehydrator about 18-24 hours. You want to make sure that the almonds are fully dehydrated because if there is any moisture left on the inside they will go bad fairly quickly. - Taste test until they are fully crispy! *The almonds must be raw for this to work! Sounds yummy! But I love raw almonds ha. I have a Ronco 5 tray dehydrator! They are usually pretty cheap & easy to find on craigslist! I have my eyes on a 9 tray Excalibur dehydrator though! !